Pentax has been a leader in the photographic field for many years. Many Pentax innovations have become standards in the industry. Pentax's enthusiasm and devotion towards the development of high-quality products have thrived over the years and continues to be stronger than ever. 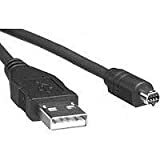 A high-quality USB cable for camera to computer connection, you can download images quickly and conveniently. It is easy to connect and use, and also features a shield covering that protects from electrical interference. This cable is compatible with the Optio 450, 550, 555, S, S4, 33WR, S40, S4i, 43WR, 750Z, S50, S5i, and X. This product is exactly what I was looking for. I searched in stores but they were unable to provide me with the correct wire.